I recently came across photos from my brief visit to Hong Kong back in September 2011 and it made me feel all nostalgic. Incense coils hang in Man Mo Temple on Hong Kong Island. I visited Hong Kong twice during my 4 years in Beijing and loved it. It was such a contrast to Beijing. Beijing is land locked, dusty and geographically boring. Hong Kong is by the sea, vibrant and surrounded by lush green hills. I was there for four days on my second visit and just spent that time wandering about taking photos. Here’s a some of my favourites (- the full album can be seen on my flickr page). Click on a photo to open a slideshow gallery. My first shot of the visit, the bustling Mong Kong. Hong kong has lots of these brooding little side streets. Catching a bus light trail in Victoria Harbour. Beans for sale! This shop was selling dried red, black, yellow and green beans from all over mainland China. I bought a few lanterns from this shop. I wish I’d bought more. I was initially confused by this stencil. I realised that it was related to the arrest of Chinese artist and dissident, Ai Weiwei, but I was a bit confused by the message. I later found out that here DEATH stands for: Don’t Easily Abandon The Hope. 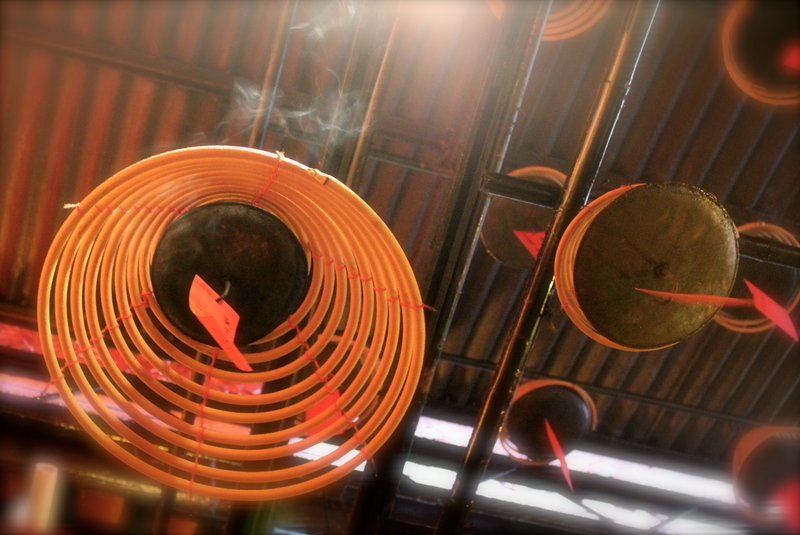 Incense coils hanging in Man Mo Temple. There was so much incense burning, my eyes started to water. Incensee burning is an age-old ritual in Chinese ancestor worship. The Big Buddha that overlooks the monastery complex becomes visible through the clouds. The monastery complex was originally founded in 1906. It’s had a bit of face lift recently. The buildings in this shot are actually souvenir shops and food stalls. Steps lead up to the Big Buddha. The Big Buddha was actually only built in1993. I overheard an American tourist asking a member of staff how old the statue was. She replied, “About 20 years.” He repeated the question about 3 times and wandered away muttering how she must have not understood his question. I ended my final day on Cheung Sha beach on Lantau Island. … and then some cows appeared. (All photos were taken with a Canon EOS 550D, using a 18-55 mm f/3.5-5.6 IS lens). What a beautiful collection of photos from Hong Kong!!! Thank you for yoru kind words! I actually felt I could have taken better shots in HK actually. I was still getting to grips with my camera and photography in general (still am!). Your blog looks great, I will be stopping by soon. Oh I know the feeling, I was pretty much working out my new camera on the go while I was in Japan. I don’t really have a great technical understanding of photography either, but I hope to change that. Yeah, self teaching seems to be the way a lot of photographers start. I try to set myself little challenges when I visit somewhere, like perspective or colour challenges. It’s a bit geeky, but it gets me thinking!